Today is the first day of autumn, when a person's thoughts turn to casseroles, soups, and red wine. Here in Los Angeles, the weather has been cool and foggy and very autumnal. Even though we're due for a last blast of summer temperatures over the weekend, my taste buds are ready for warming, comforting food and wine. If your taste buds are turning in this direction, too, you might be looking for a good Cabernet Sauvignon. The 2007 Concannon Vineyard Cabernet Sauvignon Conservancy is worth seeking out for its excellent QPR. (suggested retail $15, but you can find it in some markets for around $11) Warm, layered aromas of cassis, black cherry, and licorice invite you to sip the wine, and when you do these notes are echoed in the flavors. An herbal taste can be coaxed out as the wine gets some air, and the aftertaste is rich and plummy. This Cabernet would go nicely with most autumn soups, stews, and roasts. We had it with a comforting, savory Shepherd's Pie topped with sweet potato. The savory gravy--made with Worcestershire and a dash of mustard--brought out the herbal flavors and the beef and potatoes were a nice pairing with the wine's rich fruit. Recently, I spent some time in France. While I have been to the country before (once as a teenager, and again with a teenager in tow), this was the first time I really got to enjoy its wine culture. What follows are some observations of how drinking French wine in situ has changed my thinking. The pleasures of a chilled Cabernet Franc... Our first lunch was at a lovely bistro in the 1st arrondissement, Restaurant Paul. (photo of the restaurant, above, from allaboutnice) We'd traveled for 20 hours, taken a brief nap, and then walked from the Marais down along the river to this wonderful restaurant. There, we had typical bistro fare (I had some wonderful lamb) and a bottle of 2007 Couly-Dutheil Chinon La Diligence from the Loire. (available in the US for around $21) It was served very will chilled--colder than most whites are served in France--with condensation beading up on the outside. Inside was a refreshing red with autumnal currant, leaf, and green pepper aromas and flavors. The entire experience was relaxing, unfussy, and unpretentious. Lesson learned: temperature matters--but you should experiment until you find what works for a particular wine, food, setting, and your own palate. Excellent, affordable wine can be found on most wine lists... Many people imagine that purchasing wine at French restaurants will be a daunting business, and expensive, too. 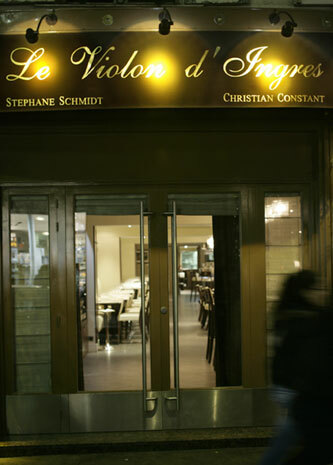 That's not what we discovered when we had dinner at Le Violon d'Ingres in the 7th arrondissement. Yes, there were white table cloths and attentive waitstaff. There was excellent food, like roasted pigeon and the most amazing egg dish I've ever tasted that involved a poached egg inside a crusted shell with truffles. There were treasures to be found on their wine list, too. A restaurant always endears themself to me when they are serving good Champagne by the glass--as in Taittinger Brut Prestige--which we had with our first courses. Then we moved on to the 2008 Domaine Chanzy Mercurey 1er Cru Les Carabys--which cost less than €40. This lovely, layered wine had fruity apple and lemon aromas and flavors laced with nutmeg and oak. It was both bright and rich, and paired with a variety of food. Lesson learned: just because you're in France doesn't mean you have to order the most expensive thing on the wine list in order to be happy. Try something that expands your wine knowledge rather than deflating your checking account. Rosé, Rosé, Rosé... What's not to like about this? Everywhere you looked, someone was sipping rosé. 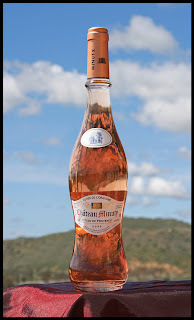 We had a wonderful rosé recommended by the local wine shop, the 2009 Château Minuty Côtes de Provence Reserve. (available in the US for around $25) The blend includes Grenache, Tibouren (new to me! ), Cinsault, and Syrah and is pale salmon in color. The wine was quite dry, with aromas and flavors of frais de bois, yet the overall impression was rich and full. 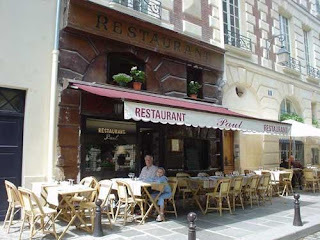 We also sipped a 2009 Domaine de l'Olivette Bandol Rosé at lunch at Les Editeurs in the 6th arrondissement while we munched on salads and sandwiches This fresh, savory wine was also pale salmon in color with subdued strawberry fruit and a slightly saline note. Lesson learned: if the French are drinking this wine morning, noon, and night it can't be THAT unsophisticated. Get over any lingering rosé complex now, and stop apologizing to friends for serving it. There are many reasons to buy wine. You like the producer. You like the grape. You like the label. You like the designation--like the time last year I splurged wildly and bought a wine simply because it was the "Plague Doctor's Cuvee." And yes, sometimes you buy it because of the name of the vineyard. Because with a name like "Jurassic Park" it has to be good, right? I thoroughly enjoyed the 2008 Field Recordings Wine Chenin Blanc Jurassic Park Vineyard (domaineLA, $15; available elsewhere for the same price) This lovely, unfiltered Chenin Blanc was a touch cloudy in the glass. It had pronounced aromas and flavors of lemon curd, touched with mineral notes and a bit of freshly mown hay. The overall impression was a well-balanced mix of citrus, stone, and grass that was refreshing and impressive for the price. Excellent QPR. A wine with this much balance can handle almost any food. We are drowning in Thai basil at the moment, and so made some Thai-influenced grilled chicken breasts. The strong herbal flavors were a nice counterpoint to the lemony aspects of this wine, and picked up the grassy notes, too. Dachshunds. We have 'em. So does Jill, the owner of my local wine store domaineLA. So when I saw that she had a wine with a dachshund label in stock, I didn't care if it was red or white or good or bad--I had to have it. 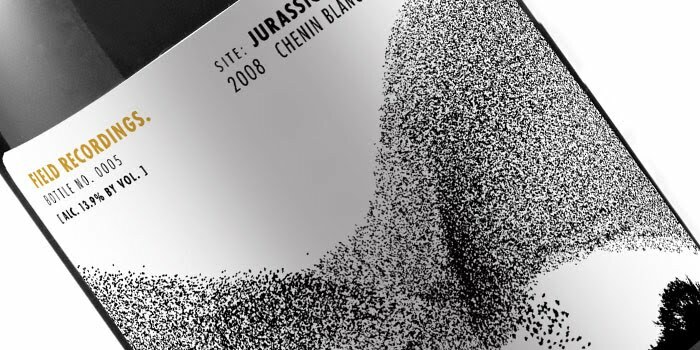 A This great photo of the label comes from the McDuff's Food and Wine Trail blog, where you can check out a review of the 2007 version of this wine. Turns out the wine is red--made from Gamay grapes. And it turns out the wine is excellent--and represents excellent QPR, too, at $15. ($15, domaineLA) Not surprisingly, Jill includes it in her "wall of affordable deliciousness" at the store. 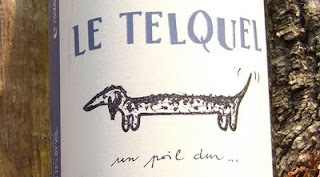 The 2009 Thierry Puzelat Le Telquel is a totally fun, totally raspberry wine. There is a hint of a spritz on the tongue at first, which I didn't think detracted at all from the pure raspberry aromas and flavors of this wine. There were some earthy, floral, and spice notes as well, but the fruit really is the star here. It is terrific served a bit cooler than you might serve other reds, which makes if perfect for drinking right now. I should note, however, that this would also be a great pick for Thanksgiving tables, too, given its affordability and Gamay's nack for pairing with a wide range of foods. We had this wine with the the best barbecued chicken we've had this summer (or maybe ever): Mike Sheerin of Blackbird restaurant's Twice-Glazed Asian barbecued chicken. The glaze includes roasted garlic, soy, and toasted black peppercorns which makes for a spicy, flavorful chicken that coaxes the pepper and spice out of this wine and makes an excellent counterpoint for the raspberry fruit. At the end of a long week, nothing says comfort and relaxation like a bottle of afffordable bubbles. Even though it's Thursday, plan ahead for tomorrow night and look for a sparkling wine that won't break the bank like the one below. It will remind you that you WILL survive, even though it doesn't always seem possible. (this great bottle shot is from Brooklynguy's Wine and Food Blog, where you can read his review of the same wine for comparison). N.V. Latitude 50 sparkling wine is made from Pinot Noir grapes (Spatburgunder, in German parlance). Made in the dry, sekt style, this wine represents excellent QPR for under $20. (domaineLA, $16.99) It is a pale, but true, rose color in the bottle and the glass. When poured, there is plenty of froth and foam that dissipates quickly. Faint aromas of wild strawberry and bread dough may have you thinking this wine will be light in taste. Instead, rich and round strawberry flavors cling to the tongue with added notes of notes of toasted bread and clay. The aftertaste picks up some pleasantly bitter nuances that add complexity to the wine and keep it tasting dry. With your sparkling wine, the perfect comfort pairing: potato chips. Chomp on your favorite, or splurge and buy Kettle Chips. I highly recommend their new "fully loaded" flavor, which will not overwhelm this rich sparkler.